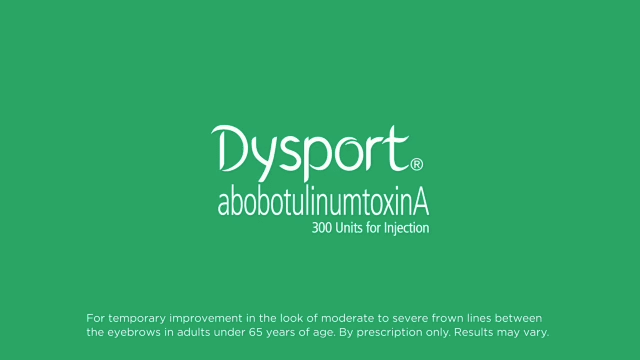 What is Dysport® (abobotulinumtoxinA) for Injection? Home  What is Dysport? *Subject’s satisfaction and self-perception reported 3 weeks after treatment (n=531). † Design: Multicenter, prospective, non-interventional observational study conducted in France, Germany, Spain and the United Kingdom (n=533). Subjects were eligible if the investigator had decided to prescribe Dysport according to the labeling. Subjects completed questionnaires at 3 weeks and 4 months after treatment. ‡User = Clinical trial subject. Watch Sarah, a busy mom, meet with her dermatologist and ask questions, and see why she chooses Dysport for a natural look. You’ve got better things to do than think about what your frown lines look like. The majority of users‖ see improvement in just 2–3 days after treatment.4-6¶ In just one 10- to 20-minute treatment, Dysport may help improve the look of your frown lines between the eyebrows for up to 4 months.4,5,7# Results of repeat treatments may be comparable to your first use. Another plus? There is minimal downtime after your treatment, which means you can get back to your day faster. 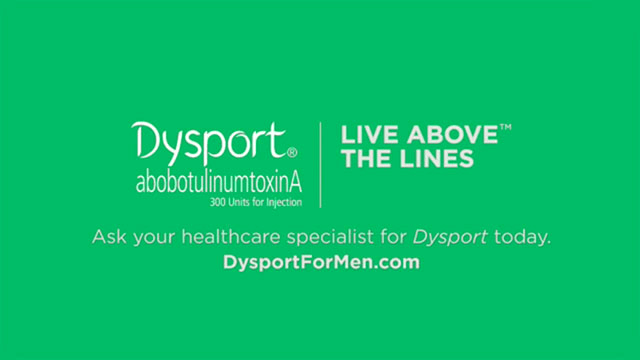 Stand up to those lines with Dysport. If you’re under 65 and seeking treatment to improve the look of wrinkles between your eyebrows, ask your specialist if Dysport is right for you. But before you begin, read below to help you make the safest, most informed decision. Molina B, Grangier Y, Mole B, et al. Patient satisfaction after the treatment of glabellar lines with Botulinum toxin type A (Speywood Unit): a multi-centre European observational study. J Eur Acad Dermatol Venereol. 2015;29(7):1382-8. doi:10.1111/djv.12881. Epub 2014 Dec 12. Data on file. Ipsen World-Wide Marketing Authorisation Status. Fort Worth, TX: Galderma Laboratories, L.P., February 2017. Medicines and Healthcare products Regulatory Agency (MHRA). Botulinum Toxin Type A Powder For Solution For Injection (Clostridium botulinum toxin type A - Haemagglutinin complex). http://www.mhra.gov.uk/home/groups/par/documents/websiteresources/con108644.pdf . Accessed May 11, 2015. Data on file. MA-Y-97-52120-719 (GL-1) Clinical Study Report. Fort Worth, TX: Galderma Laboratories, L.P., 2007. Data on file. MA-Y-97-52120-718 (GL-3) Clinical Study Report. Fort Worth, TX: Galderma Laboratories, L.P., 2007. Data on file. MA-Y-97-52120-085 (GL-2) Clinical Study Report. Fort Worth, TX: Galderma Laboratories, L.P., 2007. Dysport for Injection Package Insert. Fort Worth, TX: Galderma Laboratories, L.P.; September 2017. The only way to know for sure if Dysport is right for you is to speak with your healthcare provider. Don't have one? Find a specialist near you who administers Dysport. 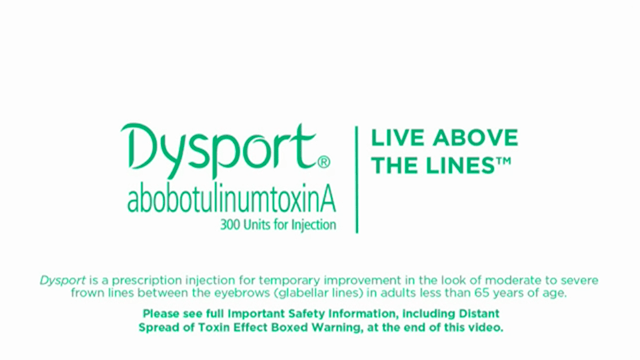 See below for Dysport Important Safety Information, including Boxed Warning, and Medication Guide.